Waking up to a loud beeping alarm clock can be a bit too harsh for some people. If you are someone who wants to smash their alarm clock to pieces regularly, you may want to try out a wake-up light also known as a dawn/sunrise simulator. These are products that promise a gentler more pleasant beginning to your day. The way they work is about half an hour before you want to get up the light gradually increases in your room in the same way a sunrise would, most people are woken by the effect, but if you don’t stir, a gentle beep will start when it is time for you to get up. By waking in this way, many people have found that they are roused in a much more pleasant mood, and feel much more refreshed and energized, especially during the dark winter months. To help you find the best dawn simulator for your needs, we have found the most popular and best-reviewed products on the market. PROS: Pleasant light, a variety of beautiful sounds to choose from, you can modify the intensity of the bulb and volume of the sounds. CONS: Difficult to set as it has many buttons and it is hard to identify the difference between the buttons. Need to Know: This is Philips’ best-selling sunrise simulator. This particular model, the HF3520, is one of their more expensive options, but it offers a colored sunrise simulation and also gives you a choice of 5 natural and calming sounds, as well as the FM radio. You can also use it as a bedside light that dims to send you off to sleep at night gently. If you are wondering what it means by a sunrise simulation, it starts as dark red, then gradually turns orange, until your room fills with a bright yellow glow just before the alarm (if set) goes off. As it is changing color, it gradually brightens up the room as well. FYI there is no replacement bulb available, but the LEDs have a life expectancy of approximately 50 years according to Philips. What users love: Users love the sunrise simulation feature as well the option to choose one of the natural sounds, that make it more pleasant than the beeping of an alarm (which is what on the entry-level Phillips model) or a radio. What could be improved? There are quite a lot of complaints about the button size and placement on this device. Many users find that the buttons are too small and all look the same and are only marked by tiny gray icons, so it is pretty hard to remember which button is for which function. Suitable for: People who want to be woken gently and peacefully before the sun comes up who would also like to have nature sounds rather than a beeping alarm or radio. PROS: Inexpensive, you can also use it as a reading light; you can adjust the brightness. CONS: No battery backup, the alarm only has only one tone settling which is a high-pitched beep. Some users find the device isn’t bright enough at 200 lux. Need to Know: This is the entry-level version of the Philip Wake-Up light. As a basic model you are only getting the one color option compared to the three in the sunrise simulation, the maximum brightness is 200 lux as opposed to the 300 lux in the HF3520 model. The other big difference is the number of alarm sound options; the HF3520 gives you five nature sound options while this model only has the one choice of the beep. There is also only one alarm setting, so you can’t have a different setting for weekdays and weekends. What users love: Most reviewers love using this device as an inexpensive option to help them wake gradually and peacefully on a cold winter’s morning. Many users find that waking up in this way help gives them energy for the day and it is an excellent alternative to a standard alarm. What could be improved: Some users would have preferred a brighter glow (if you are worried it won’t be bright enough look at the Philips HF3520 model instead). Users would also like to see an alternative to the classic annoying alarm clock sound. Suitable for: Users on a budget who are looking for a gentle way to get out of bed. PROS: Inexpensive, you can turn off the display. CONS: The controls may be difficult to use for some users. There are many imitators of the Philips Wake-up devices, and hOmeLabs Sunrise Alarm Clock is one of your better bets if you are looking for a cheaper option and don’t want to spend the extra money to go for the Philips brand name. What users love: You get the gentle wake up that the device provides. You can adjust the time for the sunrise so that it doesn’t have to be programmed to 30 min. before the alarm goes off that some other products require. It has a battery backup, which is always an essential feature on an alarm clock. What could be improved: Some users would prefer that the brightness started at a lower setting. There are a few reports of the controls being difficult to use and not very responsive. Suitable for: Anyone who wants this type of device to get them out of a dormant state, but don’t want to spend a lot of money to get one. PROS: Inexpensive, an excellent alternative to higher priced products. CONS: Some issues with the metal prongs not staying in sockets. Need to Know: An inexpensive alternative to the Philips options. It has the sunrise effects, as well as six nature sound to help wake you. The device turns on 30 minutes before alarm time and gradually gets more bright as it gets closer to the time of the alarm. You can also use this light as a bedside lamp. It comes with a USB port, and it is rechargeable so you can connect to USB port on your computer, laptop, TV, power bank, etc. to recharge. What could be improved: Some users find the glow to be too bright even at the lowest setting (ten settings available). Suitable for: Those on a budget. The main point of these devices is to help people who have to get up in the dark waken from sleep more naturally by mimicking a sunrise. 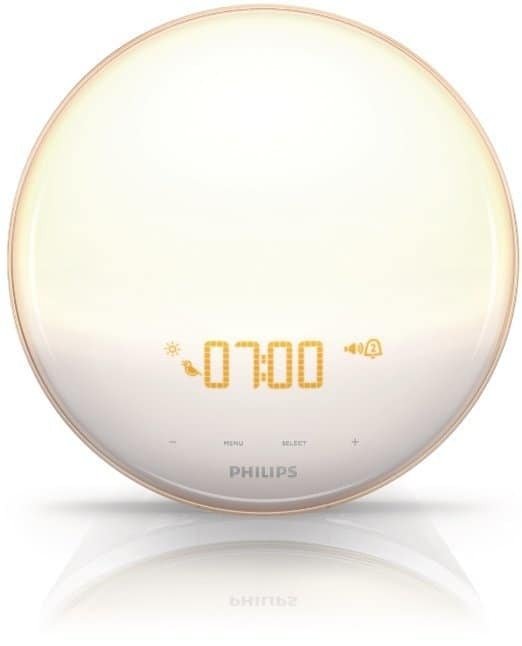 Results of studies that the company Philips were involved with indicate that people who use one of the Philips Wake-Up Lights find that it helps them arise more pleasantly and makes it easier to get out of bed. If you are looking for a product to help treat SAD, you can get options that combine dawn simulators with bright light therapy. Option to be able to turn the sound off completely: There is a good chance if you are looking to avoid a loud ringer when being woken, you may be sensitive to sound and don’t want any sound when being woken up. Generally, the way these devices work is that the glow will start with the device switching on until it is sufficiently bright and a beep will begin – to ensure that you are awake. Theoretically, you should be awake and able to turn off the beep before it begins. Most models either have an option to turn the audio off or at least turn the volume to a minimum so you cannot hear it. 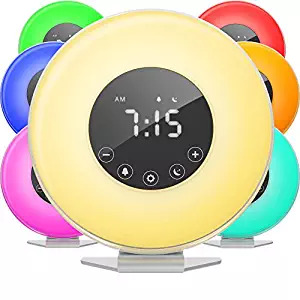 Color: Because the point of these alarms is to mimic a sunrise you can expect the intensity of the light to be at the very minimum a warm yellow color to the soft dawn reds through warm orange to bright yellow of the higher end models. Ability to dim the time display: Some clock displays can be quite distracting when trying to fall asleep. If you are someone sensitive to any glow when trying to get to sleep, ensure the device you get gives you the option to dim the display. The number of alarm settings: A feature that is common on many regular alarm clocks is the option to have two different alarm settings, one for weekdays and one for the weekend. It isn’t a standard feature on the cheaper sunrise simulator models, so if this is a feature that you need you will have to pay a bit more for that. Sound choices of the alarm: On lower end models you will usually have the option of a beeping sound or the radio if you choose to use the alarm sound as well as the glow. The higher-end models include the option to have things like Bird Song, Birds in the forest, Zen Garden, Gentle piano and Seaside Sounds. Lux Value: The lux value is the unit of illuminance and luminous emittance, which just means the level of brightness. Sunrise simulation products generally use light sources that range in illuminance from 100 to 300 lux, while the dawn simulation devices that include the bright light therapy are usually around 10,000 lux. Battery Backup: A significant option on any alarm clock is having a battery backup option in case your power goes out. Oddly enough, the very popular Phillips models do not include a battery backup. Powered by battery or electricity: If you are using the product as SAD bright light therapy (in addition to an alarm), you may want a battery-powered device if you are going to be moving it around to different rooms, as it would be more convenient. Size: Another feature to give some thought to is the size of the device. Some models are relatively large so if you have limited space beside your bed that may be something you need to consider. 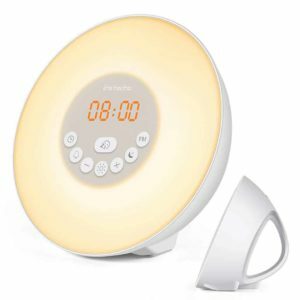 The very popular Philips Sunrise is 10″ X 10″, which is not small. Radio: Does it have one, do you need one, and what are users saying about the sound quality of the radio. 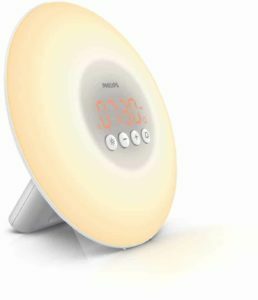 Reading light/Sunset simulation: Since some of these alarms use a good amount of space, you can generally use them as reading lights as you’re getting ready to go to sleep. Some offer the function of a sunset simulation to help you get to sleep. SAD therapy: The Philips designs offer light therapy but not the full spectrum of SAD light therapy. Price: These devices range in price from around $60 on the low-end upwards of about $150. Obviously, the more you pay, the more features you get. For a less expensive DIY option you can try using existing lamps with holiday light timers, they won’t have the gradual sunrise effect, but for a couple of bucks, you can get a similar result. Waking in the morning can be an unpleasant experience, especially if you are being jolted awake by a super loud ringer. Research seems to show that using light instead of sound will welcome you to your day in a more pleasant manner and help give you more energy for your day. There are lots of different options if you want to be woken up by light rather than sound. You can purchase artificial sunrise simulators that you can program to turn on when you want to get up, or if you would like a more gradual awakening. They don’t work for everyone, some users find that they are unable to awaken by the glow alone and need to also have some kind of sound option in addition to the light. Other users have found these lights life-changing and swear that they will never go back to waking using a traditional alarm. People feel more refreshed and discover that it is much easier to get up when using these devices.